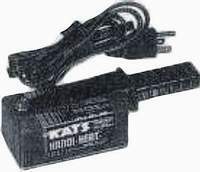 Home > Parts > Block Heaters > KATS "Handi-Heat"
This magnetic block heater has a 6' electrical cable, instructions, and a display box. Standard 115-120V AC, 180 Watts, 2 Amp maximum draw. Surface area is 2-3/4" x 3-3/4", and the surface heating range is from 300º to 400º F. This model can be removed in warm weather.